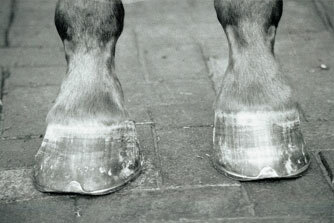 The foot has traditionally been considered the most significant site of lameness. While the relative incidence may have altered vis a vis upper body sources (because of the nature of horse usage today) the old axiom ‘no foot no horse’ still holds. Because of the very nature of the foot and the concussion it absorbs, foot lameness is always a limiting problem. As it is usual to use shoes, there will always be an incidence of bruising and infection and it is arguable that modern concepts add to the incidence of such problems, e.g. natural balance shoeing, the use of heartbar and other types of surgical shoe in riding animals. Natural balance ignores the significance of the hoof wall in supporting the shoe, predisposes to bearing inside the white line, often extending ground contact backwards, thereby disturbing the way the foot lands and through that the whole dynamics of the limb at the point of concussion. These are all serious matters that require appropriate research before they become accepted as standard. The use of shoes that reduce the horse’s ability to grip lead to injury because animals try to compensate by overusing muscle to maintain balance. The consequence is muscular injury and a need for treatment. There also needs to be a healthy scepticism of the incidence of ‘navicular disease’, if the condition occurs at all as a source of primary foot lameness. We need to consider the influence of other concussive changes within the foot, especially the effects of calcification in the spongy tissues at the back of the foot and the influence of jarring on the pedal bones themselves. Foot balance is a critical factor which, unfortunately, today, has become all too common a source of lameness. The picture on the right demonstrates how abnormal wear of the shoe may be expected when balance is lost and, as in the left foot here, contraction appears to have occurred. Sadly this is not an isolated picture but represents a problem that will need to be addressed.